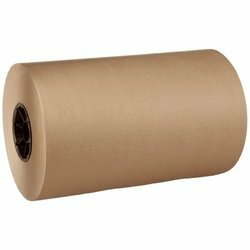 We manufacture moisturizing kraft paper tapes for corrugated boxes, which has an excellent adhesion and grip. We bring forth for our clients an enticing range of Gift Wrapping Paper, which is offered in various colors and patterns. It is made using superior quality material and is extensively used for wrapping various gifts. Our range of Gift Wrapping Paper is in great demand amongst the clients due to its beautiful designs, light weight and attractive look. We being the principal association are affianced in making available the important clients' ideal quality array of Shoe Wrap Paper. We are offering Wrapping Paper to our clients. We bring forth for our clients an enticing range of Gift Wrapping Paper, which is offered in various colors and patterns. It is made using superior quality material and is extensively used for wrapping various gifts. We manufacture speciality coated papers for wide based excellent resistance to oil & grease. The coated paper is qualified & tested as suitable for direct food contact. We manufacture & export generic Grease Proof Paper For Burger Wrapping for over the counter sales of various burgers, sandwiches, etc. We have wide range of Glitter non woven paere which is widely used for wrapping of flower bouquet. Rama Pulp and Papers Limited deals with a wide range of products in Specialty and Cultural grades of paper, build the spectrum of products on its two manufacturing lines, which are serving the respective segments. Rigorous, vigilant and strict quality parameter has given an edge over the competitors.